I am a bit sad to have to tell you this is the final day of #BrunchWeek. I hope you have enjoyed it as much as I have. My must make list is about a mile longer and I can't wait to try some of the fun recipes I've seen! This final recipe is a perfect brunch dish in my eyes. It is a slightly more grown up and definitely more savory version of one of my all time brunch favorites, the Belgian waffle. Using some inspiration from the decadent French sandwich, the croque madame and sprinkling in a healthy dose of Cabot Vermont Cheddar Cheese for a new brunch treat. That's right, folks! I took a French sandwich, a Belgian waffle and the finest of American cheddar cheeses for an international brunch delight. It is a small world after all! I topped it with a farm fresh poached egg straight from my parents' house for a touch of eat local and farm to table too. This dish covers all of the bases! Let me break it down for you a little more. These waffles aren't just any old waffles. They are stuffed with ham and freshly grated cheddar. Then they are cooked until golden and crispy. They would be great with some butter and syrup and you should definitely try that someday. But not today! Oh no, today you are going to spread some bechamel flavored with a bit of Dijon on it. Then you are going to grate some of that delicious cheese on top. Go ahead, pile it on. This is your brunch, you might as well go for it. Now stick that puppy under the broiler until everything is gooey, bubbly and scrumptious. 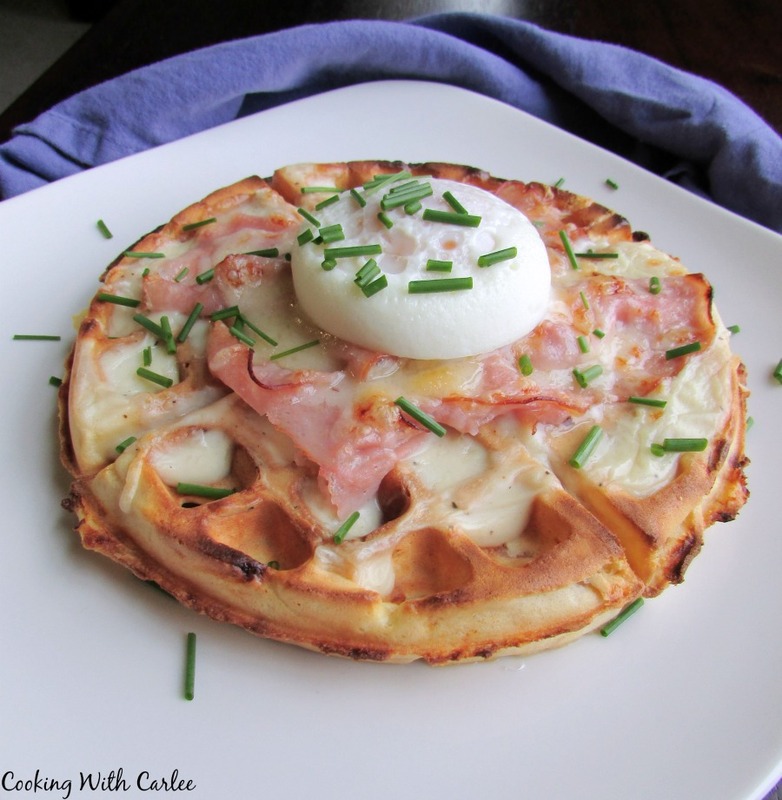 Now put a perfectly poached egg on top and admire your creation. Not bad, huh? Ok, go ahead and dig in! I dare you! In a small saucepan or skillet, melt 4 Tablespoons of butter over medium-low heat. Whisk in 4 Tablespoons of flour and cook for a couple of minutes, stirring frequently. You don't want to brown, just enough to cook off the flour flavor. In a large bowl, stir together the 2 cups of flour, baking powder and salt. Mix in the eggs, milk and melted 1/4 cup of butter until just combined. Fold in the ham and cheese. 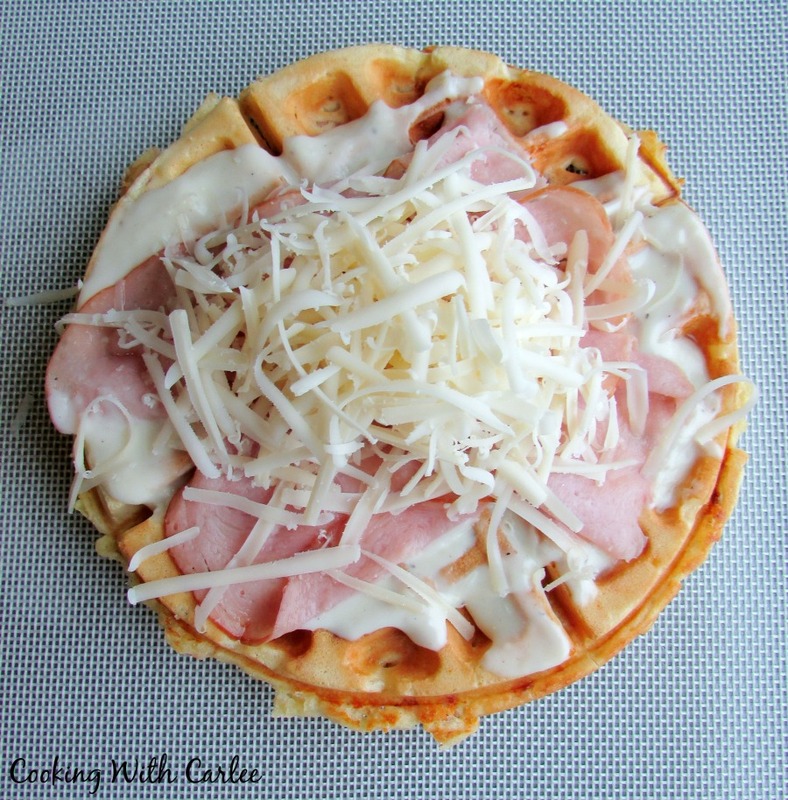 Top a waffle with about 1/6 of the bechamel sauce. Place 3-4 slices of shaved ham on top and sprinkle with cheddar cheese. Place on oven safe pan and broil until the cheese is melted and the bechamel is hot and bubbly. Move to serving plate and top with an egg and chopped chives if desired. If you are looking for more great brunch ideas, there is always the savory Parmesan and polenta brunch bowl. Maybe you are looking for something more on the sweet side? How about red, white and blue sourdough waffles or brownie baked oatmeal? What are your favorite brunch dishes? Hi Carlee, I love waffles, but would never have thought to have a savoury topping! The toppings compliment each other perfectly and just thinking about it is making me hungry! Thanks, Debbie! 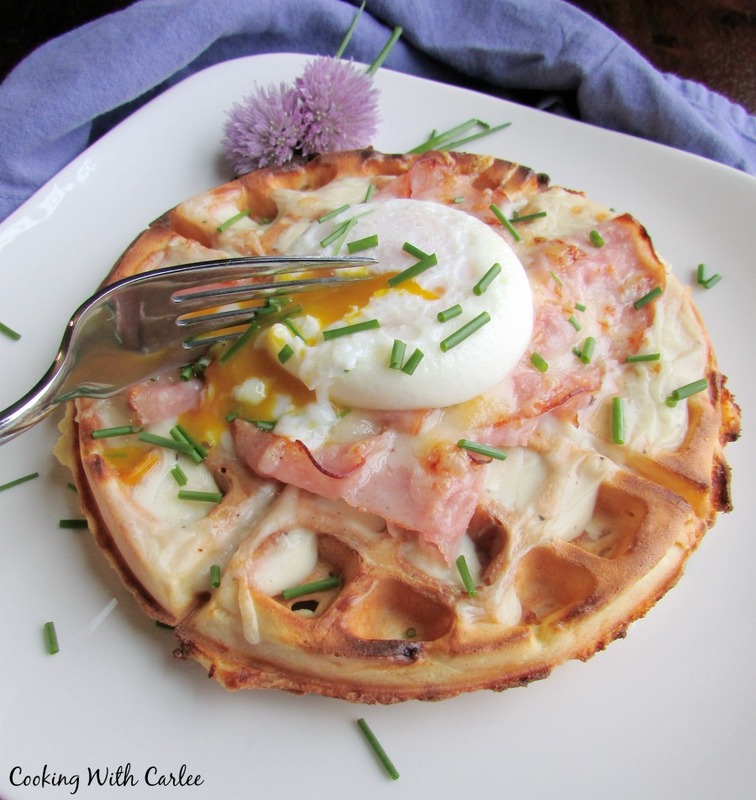 I love these flavors together and it was fun to bring them together on top of a waffle! Mmmm - I see a delicious breakfast in my future! I would be honored if you'd stop on over and share this on the What's for Dinner link up!! He won't eat ham?! I didn't know that was a thing! ;-) Bacon would be great. Thank you so much, Jessica! It really is! ;-) Thank you! Recipes like this are why I shouldn't read so late at night! It's 10 pm and now I want to go make waffles and create this deliousness! Seriously, Carlee, this looks amazing! Just make them first thing in the morning! They are sooooo good and really don't take that long to put together! 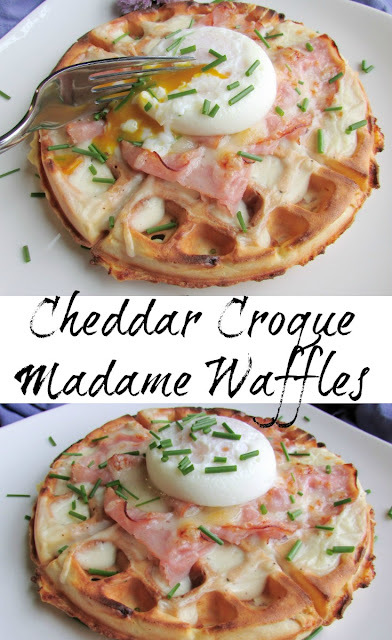 This would be a wonderful brunch dish! Thanks so much for sharing this awesome post with us at Full Plate Thursday. Hope you are having a great day and come back soon! What a great dish, and now I want some. Thanks for stopping by and linking it to First Monday Favorites. It is definitely worth making. Thanks, Sid! I put this on my list to make when I first saw it but haven't gotten to it yet. I can't wait to try it. I hope you love it! Thanks, Wendy! Come on my way! I'd happily make some for you!